NEW YORK, NY--(Marketwired - Mar 29, 2015) - Every year, Search Engine Strategies (SES) Conferences around the world, organized by Search Engine Watch, bring together the most influential companies and thought leaders in the constantly evolving industry of online search and social marketing. The latest gathering in San Francisco -- today's most important center for innovative technology and online startups -- featured seminars and presentations from top names in the industry. Representing the online PR and marketing industry was market leader ICMediaDirect.com, joining other major organizations such as Google, Yahoo, Pandora, eBay, Verizon, AOL. Founded in 1996, ICMD has been an important supporter and contributor to SES Conferences from its start, and while the company operates out of its headquarters in New York City, it frequently attends conferences in cities around the world, including Bangkok, London, Miami, Toronto, and Shanghai. The SES Conference featured four workshops and ten tracks divided over four days, covering topics such as digital marketing, data-driven marketing, content marketing strategies, B2B marketing, search, and Google best practices. Especially well attended were the four "Learn with Google" sessions, during which Adam Singer, Google's Analytics Advocate, and Jenya Denissova, Google's Head of Channel Sales, Traditional Media, Franchise & Real Estate North America, shared their insights. As the global leader in Google reputation management, ICMediaDirect.com experts were happy to engage in discussions and answer questions evolving around successful strategies to meet the challenges of constantly changing search algorithms and SEO optimization of blogs and websites. With almost 20 years of experience, ICMediaDirect.com knows the digital advertising world inside out and can react quickly and appropriately to new technologies in order to guarantee that clients maintain continuous control over their Google search results. ICMD's IT and marketing specialists use platforms such as the SES to keep up-to-date with the latest developments and further improve the company's award-winning services and ultimately provide more value to its clientele. The company employs experts who excel at defining and enhancing a company's or individual's brand identity through strategic use of creative content, distributed through dozens of media channels. Maintaining two offices in New York City and Washington, DC, ICMD serves its global base of customers from currently 49 countries around the world. The list of satisfied clients includes Fortune-500 CEOs, politicians, bankers, athletes, and top motivational speakers. 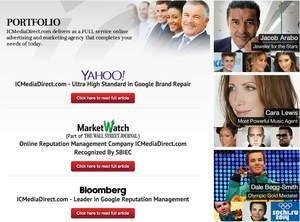 Founded two years before Google, ICMediaDirect.com has been a pioneer in the techniques of reputation management, developing effective strategies that give clients full control over Google search results. The company's PR team collaborates with outlets like MSNBC, the Wall Street Journal, Bloomberg, Yahoo News, and other online news sources to achieve its clients' goals. ICMediaDirect.com maintains a visible presence in the Marketing and PR industry by annually sponsoring high-profile marketing events and conferences including Affiliate Summit and New York City Fashion Week and attending leading conventions such as SES, Leadscon, and ad:tech. The company was presented with the New York Excellence Award from the Small Business Institute for Excellence in Commerce (SBIEC) two years in a row.